The impetus for creating this showcase comes from a love of live arts, bodies in motion, the word spoken out loud, the inquiry of space, sonic metaphors, and ultimately the legacy of culture that each artist carries within. We are artists of color drawing from our experience to reflect what is at stake in our lives. So Much Junks! pays tribute to my parents, Frank and Cris Cachapero, two of the many pioneering first-generation Filipinos who laid the foundation for my life and who contributed to the cultural vibrancy of the San Francisco Bay Area. As we are witnessing on a daily basis the rapid changes throughout our communities, may we recall, reclaim and celebrate the memory, heritage and history of all those who have helped create this rich community that so many call HOME. Founded in 2013 in Oakland, Pr3ssPlay Poets is an all-female poetry, spoken word and theatrical performance collective and production company committed to blending art and language to inspire, stimulate, and cultivate the community through accessible, multi-disciplinary performances and workshops while providing fine arts experiences. Text by Debby Kajiyama; Interrogation questions based on an interview of Darren Wilson. NAKA expands the inquiry into state violence that they began in The Anastasio Project. This work considers the ominous disappearance of 43 students from Ayotzinapa in Guerrero, Mexico. Authorities unearthed numerous mass graves during the search for the missing students. What are the parallels with state violence and control over bodies we find in the US? 1968 was an important year. Martin Luther King was murdered. The Vietnam War was raging. Nelson Mandela and a system called apartheid was suddenly on the radar. There were demonstrations across the country, not just here, but in Europe and South America. Imperialistic ventures in Iran, Iraq, Angola, Mozambique, Guatemala, Argentina -- to name a few -- were no longer undercover, and in 1968, two weeks before the Olympics opened in Mexico City, there was a massacre of students cleverly hidden from a visiting world that we would like to have remembered. Written in response to the murder of Anastasio-Hernandez Rojas by over a dozen Customs and Border Patrol agents, this spoken word piece was written by Tane Madrigal as part of 67 Sueños while he was a high school student. The poem became the inspiration for NAKA's full evening work, The Anastasio Project. 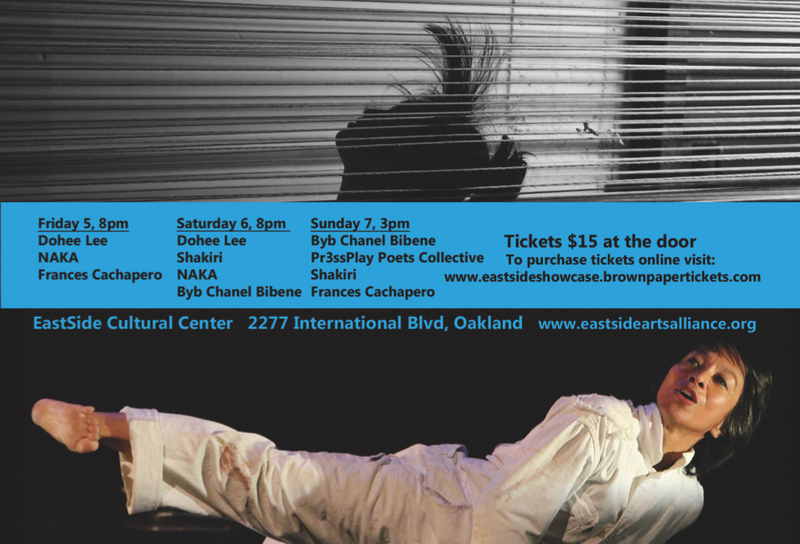 EastSide Arts Alliance Presents’ performance programming is funded in part by the William & Flora Hewlett Foundation, the Akonadi Foundation, and the generous donations of our community supporters.